Locations for the upcoming public art installation, Green Candy, have been announced. International and local artists will be transforming four sites around downtown Fayetteville into works of art. Experience Fayetteville is presenting the event and appointed global creative house Justkids to curate Green Candy, an art action aimed to create community conversations around waste and sustainability through engaging art projects. Fayetteville has long been the artistic epicenter of Northwest Arkansas, thanks in large part to the University of Arkansas, which — as the state’s oldest and largest college campus — has influenced Arkansas culture since its founding in 1871. Just Kids and Experience Fayetteville are currently accepting proposals from Fayetteville-based artists (artists either residing in or actively involved in the Fayetteville art community) to participate in a public art event to be held during the final week of August 2017 by creating original artwork (sculpture, installation, mural). One of Northwest Arkansas’ most anticipated midsummer events is back! The Botanical Garden of the Ozarks will transform into an exciting land of imagination for the 2017 Firefly Fling on Saturday, July 15, from 6 to 10 pm. 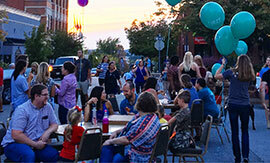 Experience Fayetteville with the locals during First Thursday, a community-centered, family-friendly event on the historic downtown square. The fun begins Thursday, June 1st, at 5 p.m. and features live music, delicious food, exhibits from local artists and interactive kid-centered activities, all in a lovely outdoor setting. Exciting new art is coming to Northwest Arkansas this summer, as Crystal Bridges Museum in Bentonville prepares to feature work by American sculptor Dale Chihuly. While Chihuly works mostly with glass, he is also known for using a variety of mediums, including ice, paint and neon. His works will be featured inside the museum’s temporary exhibition gallery as well as outside in the beautiful woods of the Ozarks. Tickets range from $10 to $20 and can be purchased in advance on the Crystal Bridges website. Artosphere: Arkansas' Arts and Nature Festival returns June 10 - 23, 2018. The festival, presented by the Walton Arts Center, celebrates artists influenced by nature, who inspire us to live more sustainable lives. Members of the artist group Fenix Fayetteville will present a three-week art exhibition and event series at the historic Walker Stone House in downtown Fayetteville from April 8-29. 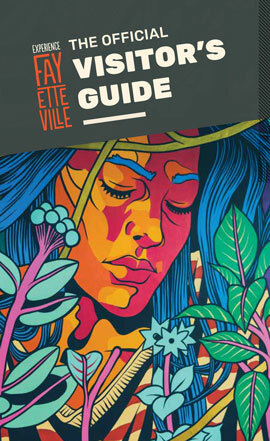 Fayetteville, Arkansas is known as a great arts destination with many public works from large murals to little-known gems tucked in the nooks and crannies. We recently wandered around Fayetteville taking in the natural beauty and snapped a few shots of some of our favorite art pieces. If you haven’t explored the art scene in Fayetteville, add it to your bucket list!